Century Camera Co, with Wollensak Optical Co shutter. Century Camera Co. was founded in 1900 by three former employees of Rochester Optical Co.. 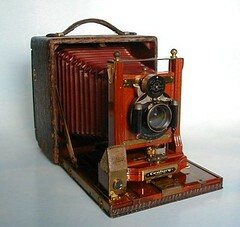 The company achieved a high quality of its plate cameras, so that it had a 25% market share in 1902. In 1905, the company was purchased by the Rochester Panoramic Camera Co. . In 1908 the company became Kodak's Century Camera Division which continued the brand Century until 1920.